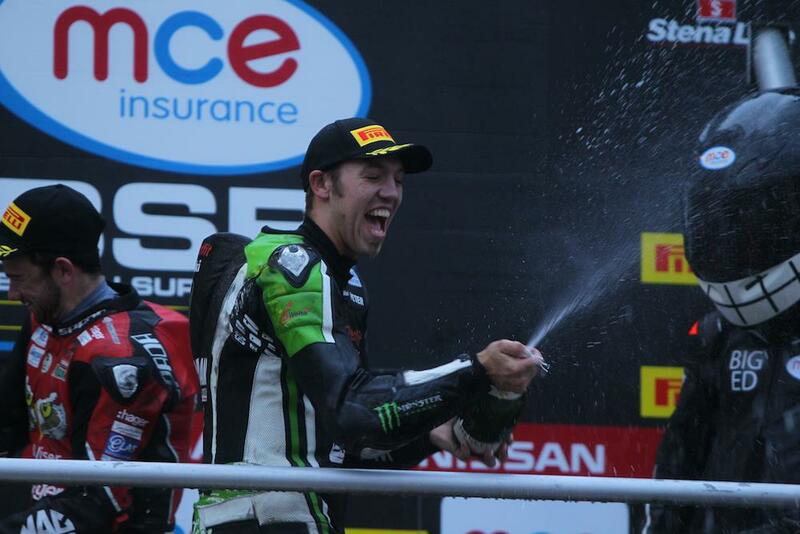 Peter Hickman took a surprise victory in a dramatic opening MCE British Superbike race at Brands Hatch this afternoon as two red flags and a drastic change in conditions spiced things up on Saturday at Brands Hatch. The race initially got underway in dry conditions, but was red flagged on the third lap after an incident involving Howie Mainwaring-Smart and Filip Backlund – who were both transferred to the medical centre. Following a quick restart procedure, the race was back in action but this time it would last just two laps as the heavens opened out the back of the circuit, leading to numerous riders calling for the race to be stopped. As the rain then stopped, a restart was delayed to allow conditions to settle but a heavy downpour as the riders headed to the grid settled any debate on tyre choice. Christian Iddon took the lead on the third start, but drama wasn’t far around the corner as title contender Haslam was flicked from his Kawasaki on the run down to Graham Hill bend. Showdown man Jason O’Halloran would also crash out on the opening lap. Meanwhile, it was Haslam’s JG Speedfit Kawasaki team-mates charging to the front with Peter Hickman taking the lead on lap three with Ellison close behind. Ellison would go on to move into the lead on lap six before becoming the next victim of the track’s greasy conditions. Tyco BMW’s Iddon pushed Hickman in the closing stages of the race but wasn’t able to get close enough to make a pass, while the Be Wiser Ducati of Glenn Irwin stole third from Honda’s Dan Linfoot. Series leader Shane Byrne was visibly struggling to ride the Panigale in the wet and crossed the line sixth, but with Haslam out he would extend his championship lead to 27 points.